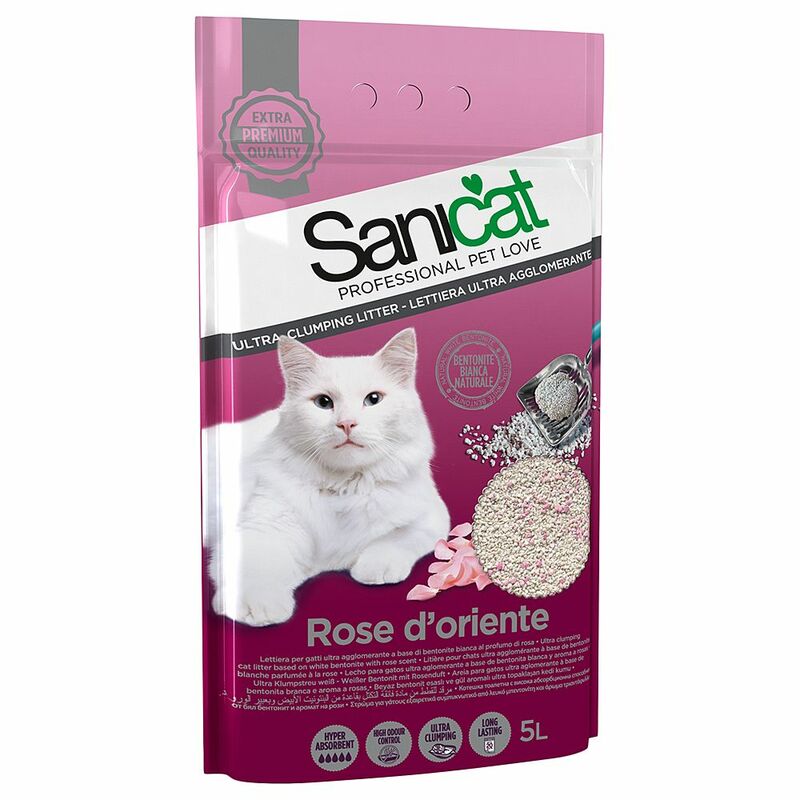 Sanicat Rose D'oriente clumping cat litter is highly effective and has great clumping power. It is made from 100% pure bentonite, a natural substance which binds nasty odours and is very economical. The litter can absorb up to 250% of its own weight and has a delicate, oriental rose fragrance. It forms small, flat clumps which are solid and easy to remove from the, clean litter. The dirty clumps not fall to pieces when removed and they do not stick to the base of the cat tray, which makes it much easier to keep the cat litter box clean. Sanicat Rose D'oriente cat litter is a natural product and doesn't contain harsh chemicals which could irritate your cat's paws. It comes in a convenient plastic sack with handy grip Sanicat Rose D'oriente clumping cat litter at a glance: 100% natural: Made from natural betonite Excellent clumping power Effective in absorbing nasty odours and liquid Can absorb up to 250% of its own weight Forms solid, flat clumps which do not stick or fall apart Kind to paws Plastic sack with grip. Price just £9.99! Click here to buy now!